Today, I would like to share what Switcheo has planned for this quarter. Before we begin, let’s look back on the past quarter to review what we’ve accomplished in Q1 2019. We rolled out the surprise Switcheo OTC feature for secure, trustless peer-to-peer trades. We launched Switcheo Account with great success, garnering over 3000 new users in just two short weeks. We upgraded NEO smart contract to V3, for more performant operations and an increased feature set. We revealed Switcheo Chest 💰, a reward system that token owners can use in partnership with Switcheo Exchange. We revamped our listings policy, improving liquidity on Ethereum pairs through external market makers — this will be further ramped up over time. We’re gradually doing a subtle theme refresh — observant users would have already noticed new colors and elements coming into play! As we wind down on an exciting barrage of launches and features, here’s what we’re up to for the next quarter. Get strapped in as we have a very packed schedule of feature and releases! Most of the releases for the first month of Q2 2019 now have a pretty firm release date scheduled, so we’ll go into these with slightly finer detail first. First up, our Atomic Swap feature is set to go into private beta on 16 April! 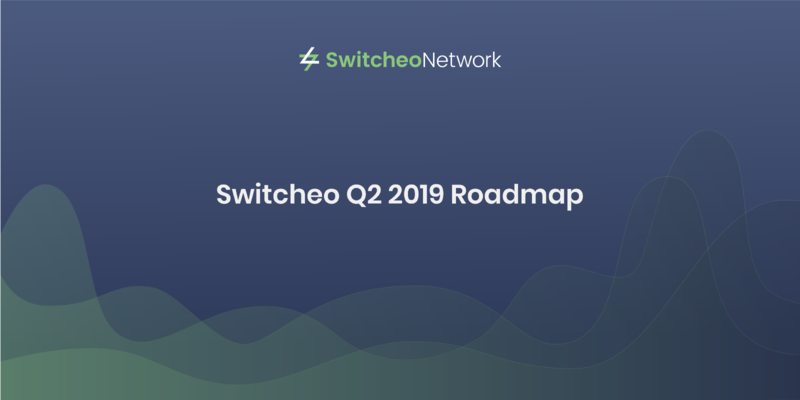 Barring any further delays, Switcheo’s first cross-chain pairing, SWTH/ETH, will launch on the 3rd week of April. Atomic swap pairings have been a long requested feature, and this has been pushed back slightly from Q1 to ensure we maintain a superb user experience in what is typically known to be a slow or “old-school” cross-chain technology. We’re really excited with what we’ve developed and can’t wait to share it with the trading community! We’ll be releasing the launch dates for our integration with the EOS blockchain soon. This integration will bring EOS markets to Switcheo Exchange. At present, the estimated beta date for this integration is the last week of April. Stay tuned for a joint announcement with our very special integration partner next week for more details! We’ll be updating our token model to better suit the future plans of Switcheo as a fully decentralized exchange. In particular, the team has been researching and implementing a fully trustless and transparent operator through a high performant public “blockchain” or “side-chain” (“Switcheo Chain”). To achieve this goal requires incentivizing sufficient public nodes to validate trade transactions. Rather than issuing new tokens for this, we have decided to adjust our token model slightly, which would instead increase utility for the existing token. Over the next weeks, we will go into more detail into what this entails, and describe the improved token model. There has been a few new wallets / dApp providers recently launched on the NEO ecosystem. We intend to provide support for them very soon. The team is currently reviewing & implementing the proposed dApp provider interface. At the moment, a few further changes and improvements will need to be added to the spec and ecosystem for fully seamless interoperability between wallets, providers and dApps. As we expand our feature-set quickly, the design and engineering team needs to take some time to step back and polish our product, as well as to clear engineering backlogs. This is extremely important to prevent software from collapsing under its own weight! While we have received feedback that the user experience of Switcheo Account is top notch, we know there are improvements that can still be done and will be perfecting this subsystem. We’ll be further improving the UI/UX for these components: Order History, Wallet Details, Transfer History. We’ll be completing our theme refresh — we’ve already improved the light theme slightly, and will be making more changes to make the exchange look and feel more dynamic and inviting. Translations need some ❤️. We’ve introduced a lot of new copywriting and will be working on getting them translated or updated. Frontend performance improvements and optimizations — this includes CPU and memory usage of the web app, initial exchange load speed, reactiveness of the user interface, and more. Here’s what we are up to for the remainder of the quarter. We aim to roll out another blockchain integration (besides EOS) within Q2. Development on this has begun, the name of the blockchain will be formally revealed at a later date. As pointed out earlier, Switcheo Chain is a public blockchain meant to accept and match trades in a trustless and transparent manner, while still being highly performant (i.e. DEX chain). The key differentiator for our DEX chain as opposed to other competitors, is that we are designing it to work in consort with trustless gateway/locking contracts on the root blockchains such as Ethereum and NEO (which we are currently also designing). We also aim to integrate these gateways and the DEX chain into Cosmos Network through the IBC specification. The blockchain is being built on Tendermint, and will likely adopt a dPOS model. Overall, moving to this architecture makes Switcheo a lot more competitive as an exchange, due to simpler and more scalable root chain smart contracts which in turn give rise to lower network fees. In addition, the simpler gateway contracts will allow us to integrate multiple smart-contract enabled blockchains in a rapid fashion. We aim to launch our MVP this quarter. While Switcheo Chain is being developed, we still want to implement some utility features and quality-of-life improvements for our regular traders. We want to continue to open source more of our codebase to give back to the community. We also want to begin accepting more public contributions for certain components, which will quicken our development pace. Improve the switcheo-js library to support more of our public APIs. These items are still being looked at, and will possibly be launched in Q2. The fiat gateway subsystem has been thus far delayed primarily due to our providers’ delays in supporting the quote tokens we wish to support. We have already completed active development since December last year, and are currently still waiting for the providers to clear outstanding legal and/or engineering hurdles. Note that our fiat gateway offering is tangibly different from other exchanges which have integrated such gateways, due to i) our unique quote token offerings, and ii) our wallet-based accounts for which we want a deeper and more seamless integration with. There has been much discussion regarding the initial public sale of tokens on exchanges as of late. The team are of course, aware of the changing landscape and have been monitoring and reviewing such platforms. While we have the technology to do such “project launchpads”, at present we only consider such an endeavor advantageous if we launch with a unique positioning that leverages our strong branding. As such, we are actively on the lookout for strong projects which fulfill our criteria before premiering such a platform — the technology of such a platform is not currently the key factor. Due to a lack of activity within this blockchain ecosystem, our research currently indicates that further development effort is likely to be a sub-optimal use of our resources. We instead want to focus more of our engineering resources on building up our trustless gateway contracts which would also be able to support the Qtum blockchain when Switcheo Chain is launched.